Dressed in an overall and a protective helmet, one would assume 52-year-old Nyovane Ndlovhu is on his way to put out a fire. 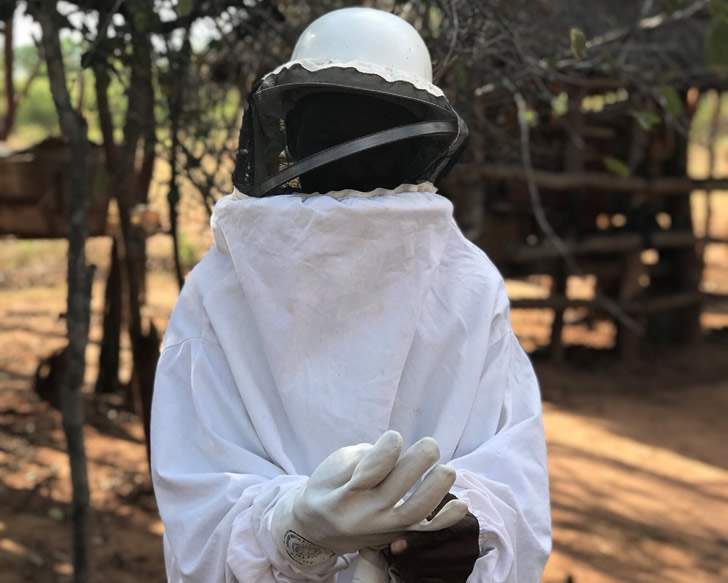 Ironically, the father of six is indeed a trained firefighter, but today smoke is his ally in a mission to harvest honey from the 132 beehives that are dotted strategically around his compound. Where other people may see 'danger' in such a high number of colonies, Nyovane sees an investment that has provided a thriving business for him and his family. After experiencing perennial crop failures in recent years due to erratic rainfall patterns, Nyovane decided to turn to beekeeping. On this day that I have visited his homestead, the honey farmer is collecting honey to exhibit at an agricultural fair that will be held at the village center the next day. "I have been traveling a lot lately," he explains, "I am going as far as Bulawayo and Harare to sell honey and to attend workshops on beekeeping." Beekeeping has evidently transformed Nyovane's life. The honey farmer narrates how he used to struggle with farming especially in the dry area of Lupane, "rains have not been good in the past few years, and this area is particularly dry even in good years. I was struggling financially, well, at least before I was introduced to this business". His wife who is assisting him to package the honey in preparation for the fair agrees: "We are making a decent living from this honey, and now most of our neighbors have ventured into the honey business too," she says. Nyovane is not the only farmer in this district passionate about apiculture thanks to an EU-funded project, implemented by FAO and other partners. Hundreds of families like the Ndlovhu's in Lupane district have taken up Apiculture. Perhaps the key feature of this project is that farmers are not just producing for their consumption or barter trade, but conforming to strict, professional industry standards to conform to established markets. The project fondly dubbed "Forest Forces," started in late 2013 with its primary goal being to support the integration of agriculture, with sustainable forest management and agroforestry practices. This was done to increase and diversify sources of food and income for small-scale farmers, thereby increasing their resilience to shocks and improving food security and food availability. The project has been promoting the sustainable use of various timber and non-timber forest products, including wild fruits such as marula, mangetti and baobab which communities are exploiting to make oil, jam, powder and other various products that I was able to witness on my trip. The honey value chain, however, stood out more to me, the excitement of the honey farmers and the genuine love they have developed for this enterprise can explain why. According to another farmer, Sibongile Mpofu, her family was skeptical when she started the venture, but they have now seen the fruits of beekeeping. "Paying school fees for the children is no longer a problem, some of the farmers I know can now even afford to send their children to boarding schools where they can concentrate on their studies better." Sibongile further advocated for beekeeping as a preferred income generation activity for widows, youth and elderly folk. "It is less strenuous than many other farming activities. All you have to do is place your hives strategically and wait for the bees to make honey for you." The farmers have also learned how to exploit other by-products that come from raw honey. Nyovane proudly shows off other products, which he has been able to extract including, candles, beeswax and various cosmetic products such as soap. After spending a day with Nyovane and his fellow honey farmers, I am convinced that the long journey to Zimbabwe's Matabeleland North Province was worth it. As we start off, smiles, song and dance bid us farewell. Later this evening, Nyovane and his family will finish preparing their exhibits and rest in preparation for the agricultural fair. It is encouraging to see communities in rural areas such as Lupane, are taking control of their destiny and thriving in drought-prone regions.